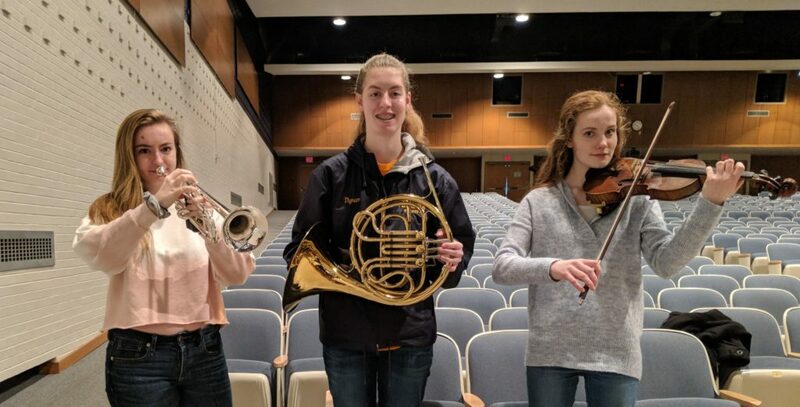 Congratulations to Penn Manor High School students Madeline Claus, Elise Thyrum and Shannon Peachey, who were named to District 7 Band and Orchestra. Elise (French horn) and Shannon (trumpet) were named to District Band and will participate in the District 7 Lower Band Festival Jan. 12 and 13 at Kennard-Dale High School and perform in concert at 7 p.m. Jan. 13. Elise and Shannon also were named to District Orchestra, along with Madeline (violin). They will participate in the District 7 Orchestra Festival Feb. 9 and 10 at Cedar Cliff High School and perform in concert at 7 p.m. Feb. 13. Best wishes to these three outstanding musicians! From left, Shannon Peachey, Elise Thyrum and Madeline Claus, who were named to District Band and Orchestra.